The fully integrated CNG fuel system option uses GM's 6.0-liter V-8 engine and carries a $15,910 sticker price. 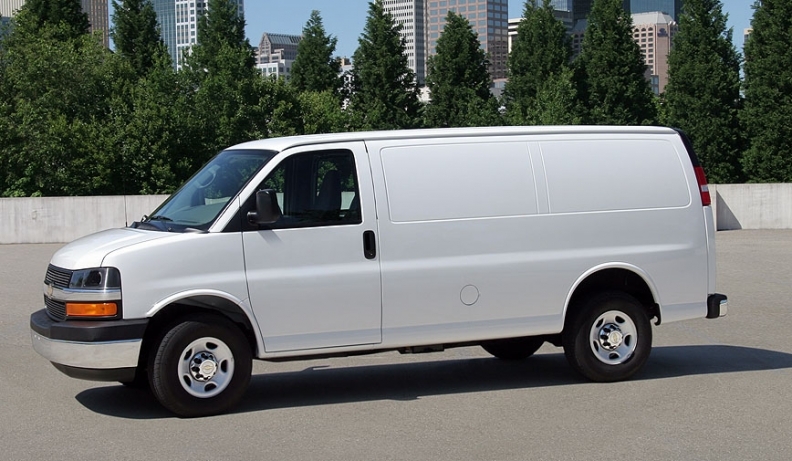 It is available on the 2011 Chevrolet Express, above, and GMC Savana. Compressed natural gas is now a fuel option for General Motors Co.'s full-sized cargo vans. The fully integrated CNG fuel system option uses GM's 6.0-liter V-8 engine and carries a $15,910 sticker price. It is available on the 2011 Chevrolet Express and GMC Savana. The vehicles were unveiled today at the Green Fleet Conference in San Diego. Before the CNG application, the engine is modified to include hardened exhaust valves, and intake and exhaust valve seats for improved wear resistance and durability with gaseous fuel systems. Productive Concepts, an alternative fuels conversion company, will integrate the CNG fuel delivery and storage system with the engine at its facility in Union City, Ind. Once the CNG system is integrated into the vans by Productive Concepts, they will be shipped to dealers or to specialty vehicle manufacturers to add commercial equipment. The CNG option is available to government and fleet customers. The vans will be covered by GM's 3-year/36,000-mile new-vehicle limited warranty and 5-year/100,000-mile limited powertrain warranty. GM said the vans meet all EPA and California Air Resources Board emission certification requirements.